The 2019 Brazil Trophy, formerly known as Maria Lenk, which serves as Brazil’s national championship begins tomorrow in Rio. Top swimmers in attendance will vie for a spot on Brazil’s 2019 FINA World Championships team, with 24 spots currently sitting vacant, with no limits set by gender. Athletes who hit a FINA A-cut in the A final, and finish in the top 2 spots, automatically make the team. The top four swimmers in the 100 and 200 free will make the team as relay swimmers, provided that their combined time is faster than the 7th-ranked time at the 2017 FINA World Championships, listed below. “Livre” is freestyle, “costas” is backstroke, “peito” is breaststroke, and “borboleta” is fly. Nearly 400 athletes are entered in the meet, representing 13 states. Minas leads all teams with 60 entrants, but Pinheiros is close behind with 55. 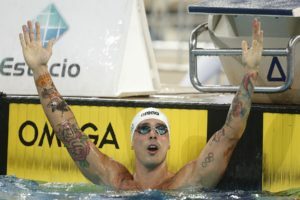 Notably, former Pinheiros star Cesar Cielo – the most successful Brazilian swimmer in history – cut ties with the team in early 2019 and is also not receiving funding from the CBDA as he is not a member of the Brazilian National Team. He opted not to attend this meet, meaning he will not be at Worlds for the first time since 2005. Brazil’s national championship is much more team-oriented than U.S. fans are accustomed to–the big teams typically bring in a couple foreign stars to bolster their rosters. This year, likely because of other Worlds qualifying meets, there are fewer than usual. The standouts include American Mallory Comerford, Ukrianian Andrii Govorov, and Argentinian Macarena Ceballos (who also competed last year). As SwimSwam reported last week, Louisville’s Comerford will make her pro debut this week at the Brazil Trophy, giving a boost to Minas. She’s entered in the 50, 100, and 200 free, as well as the 50 and 100 fly. Fellow Lousville post-grad and Brazil native Joao de Lucca is a member of Minas, and the team approached Louisville head coach Arthur Albiero (also a Brazil native) about bringing Comerford out to the meet, and they obliged. Comerford’s best times put her at the top of the field. No other woman is entered with a sub- :54 in the 100 free (Comerford’s is entered at 52.94), and she’s one of three entered under 2:00 in the 200. In the 200, her lifetime entry time of 1:57.92 puts her in a close race with, Manuella Lyrio, her closest competition at 1:57.99. Minas is also bringing the 50 fly world record holder Govorov, who is entered in his signature event as well as the 50 free. 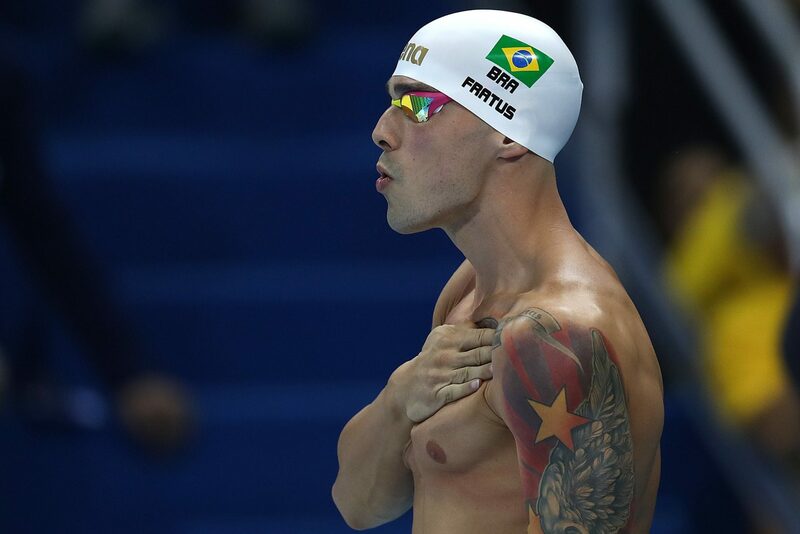 So despite Cielo’s absence, there’s plenty to watch in the men’s sprint races; the 50 free also includes Olympian Bruno Fratus, de Lucca, Nicholas Santos, Gabriel Santos, Marcelo Chierighini, and Pedro Spajari. We’ll see backstroke specialist Etiene Medeiros in the 100 free. She’s always held her own in sprint freestyle, but said earlier this year she’s shifting her training away from backstroke to focus more on the 100 free in an attempt to make the 2020 Olympic team on a relay. Recent NCAA champion Vini Lanza will make his pro debut. He’s entered in the 50, 100, and 200 fly, as well as the 200 IM. Brandonn Almeida, a former South Carolina Gamecock and world junior record holder, is entered in the 200 and 400 IM as well as the 200 free and 200 back.